Steve aoki was on top of his game!! Great show and the sound quailty in the barras was first class..
One of the best DJ´s of all time! His performance was unbelievable, and overall the experience was good. Doors opened at 7pm, the queue was not too long, they handled everything very well. Would do it again anytime. Steve Aoki has enjoyed a glittering career which has seen him nominated for a Grammy Award with his album debut; Wonderland. His fusion of electro, house and rock music has placed him amongst some of the biggest names in the industry. This year sees the release of his forth studio album. Titled Kolony, the buzz around it release is huge and he promotes the new material with a massive UK tour which takes him to O2 Academy Brixton in London, Manchester Academy, Cardiff University Great Hall, O2 Academy Newcastle and O2 Academy Glasgow. 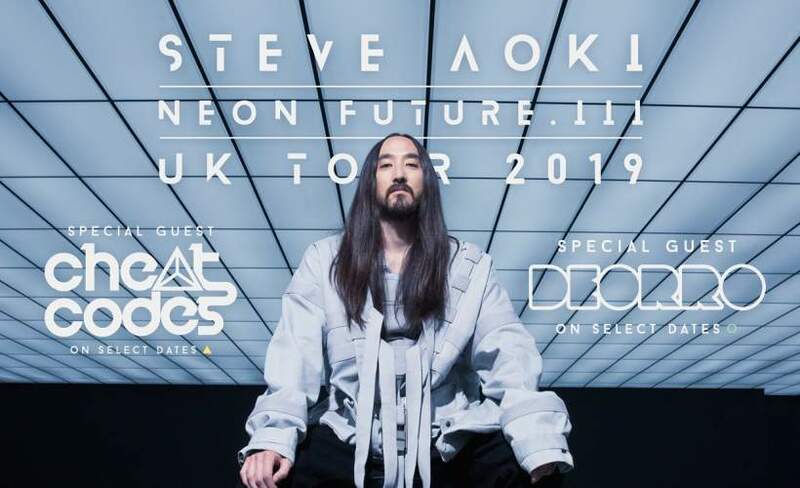 We are very excited to be able to offer these Steve Aoki tickets, but we really do urge you to book early as these shows will sell out very quickly. You can place your gig tickets order 24/7 using a computer, tablet or smartphone whilst busy on the go or while you are relaxing at home. Born in Miami during the Autumn of 1977, Steven Hiroyuki Aoki initially pursed his political interests studying two undergraduate degrees in feminism and then sociology. It was whilst studying at University Of California, Santa Barbara he became a founding member of the Revolutionary Anti-Imperialist League. Developing his interest in music, Aoki started the highly influential record Label Dim Mak in the mid 90’s which would come to define the sound of electro and dance orientated indie music in the US over the forthcoming decades. Aoki took his passion further and began to remix other acts before building his name through relentless touring, working with such huge stars as Iggy Pop, Linkin Park and Fall Out Boy on his way to become a world-famous superstar DJ. We are excited to be able to offer you Steve Aoki concert tickets, but with only limited supplies being made available by the organisers you will need to act fast and book yours before they are all snapped up. By providing excellent customer service whilst you choose from a massive array of essential gig tickets, Gigantic is the very best place to come to make a stress free booking before enjoying your big night out.